I’m trying out a new soylent-ish powdered nutrient slurry, 100% Food. I got the low-carb chocolate mix. It comes in single serving bottles. The bottle is half-full with powder. You add water on your own. I love this approach, since the bottles are super light without water. OTOH it’s ugly and wasteful from an environmental point of view. Compared to Soylent, it is a bit less filling. I could get to prefer that, I think. The serving size is 670 calories instead of 500, which makes a 2000 calorie daily intake harder to figure out. 100% Food mixes up faster than Soylent, in that it doesn’t need to sit in the fridge for a while. However the texture is rough and grainy. I’ll try mixing it in the blender to smooth out the texture. Most streaming listeners will not subscribe, now or ever. The 80/20 rule is that the 80% will never subscribe. Most streaming listeners prefer minimal engagement. Having to engage is a problem. Non-interactive apps like Pandora provide more value than interactive ones like Spotify. The 80/20 rule is that 80% prefer passive options. Social information about what peers are listening to. I have been living on Soylent for the past couple weeks. This is to diet. My thinking is that this makes it practical for me to count and ultimately limit calories, since the calories in Soylent are measured in advance. One cup is 500 calories. If I eat four meals, I get exactly 2000 calories. As it turns out, that has produced a 6.5 lb weight drop. With salt, pepper, chicken stock, and steamed broccoli, like a soup, for dinner. For the sake for variety, I am starting to explore the smaller brands. I just ordered 100%FOOD. Something like Google Glass would be great for Pokemon Go. They should rebrand as Pokemon Glass. MusicAlly profiled prior art for music AR, an app called Landmrk. Landmrk framed this as a promotional campaign for a couple different album releases, creating visibility by motivating fans to engage with new releases. “When someone enters one of these locations, the content can then be unlocked on their mobile device. When they leave, the content becomes inaccessible again,” explains the company’s website. Account director Tom Nield explained to Music Ally that the team was originally part of music group PIAS, where it worked with artists including Alt-J. After striking out on its own, the band came calling. “They were releasing their new album, and wanted to create a unique first-listen experience around the release. They had some ideas around placing park benches where fans could plug in their headphones and listen, but it would have cost an absolute fortune,” said Nield. I came across a dongle for iOS devices that allows you to look at the real world using infrared. It struck me as something like augmented reality layer. You could write messages that were only visible with infrared. Which reminds me of Boris Smus’ idea to emit ultrasonic audio using the web audio API. It strikes me that you could also use that for music, so that the music was available as an AR layer, discoverable using ultrasonic listening. The one-drop rule is the cornerstone of American racism, but we are hardly aware of it. You may not even have heard the phrase. It’s the difference between “Black” and “Colored.” If African genes joined your family tree within the last 400 years, you may be light or dark, but you’re a Black person. No source but Africa can make you Black. Not Native America, Latin America, the Middle East, South Asia, or Polynesia. Lots of roots can give you pigment, but African genes are magically powerful. The one-drop rule is a ratchet, not a bidirectional pipe. President Obama is 50% White, but he is Black. Americans actually act like this is based on reality. Blackness is such a powerful state of being that the slightest hint of a taint appears and you’re at the Black table. Nobody ever calls Obama White. I love the phrase “mixed race.” It’s the opposite of one-drop thinking. A mixed-race person is not one-drop Black. They are a confluence. The existence of “mixed race” thinking makes me hopeful. An end game for Spotify is to gain enough market power to get better deals from rights holders. Critical mass of subscribers would create leverage. The more competitors they have, the more fragmented the market, the more labels can play subscriptions services off one another. Deezer just entered the American market. The playground was full of parents staring into Facebook while their kids had a lonely time on the slide. We were at the Tesla of playgrounds, Magical Bridge in Palo Alto, yet there was begging for Pokemon Go. Eventually I caved. I wouldn’t have given in for straight screen time, like a movie or game, but AR is different. My younger guy, who doesn’t totally get PKG, got bored and climbed a tree. My older guy fiddled with the phone, every once in a while looking up to square with the world. At one point he took off like a shot to run around a long fence between him and a virtual pokemon, and then withdrew into the virtual layer again. Yes, augmented reality screen time is more active, engaged and physical than watching a video or playing a game. But I’m on the fence about whether it increases activity and engagement or detracts from it. AR screen time is less passive than ordinary screen time, less about the world in the phone. But that’s not much of an improvement if the kids were going to be out in the world engaging at full title. The question isn’t whether AR is better than than full-on screen time. It’s whether AR is better than full-on play time. From a parent’s point of view, augmented reality needs to increase physical activity, or keep it steady but add an intellectual component. I mentioned Biba in my notes on the Shape conference. It is an AR layer tightly integrated with a playground, for the purpose of improving on real world experiences. It’s funded by a company that makes play structures. 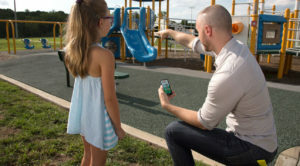 Biba games turn the screen-time kids love into the outdoor, physical and imaginative play that parents know they need. Biba uses the smartphones found in every parents’ pocket or purse to unlock new and exciting games every time a family visits the playground. And it’s not just fun for the kids! Every gameplay session generates a series of family friendly fitness metrics that let parents track their kids’ progress. In this arrangement the real world comes first. AR is an enhancement. I went to the Shape conference today. Conference hipsters would not admit to this. None of the friends I asked would come along. But I am not too proud. I am going through a time of observing patterns and learning about developments outside my bubble in music tech, and conferences are great for that. The talks were almost all weak, except for the keynote by Kurzweil, and even though he has a lot of worthwhile stuff to say you can tell he’s running through a well worn script. Caruma is a connected sensor array that you attached to the interior roof in your car. It has a camera for the exterior and another for the interior. There are 4-5 other sensors, like an accelerometer. There’s GPS and a net connection. I think it was $300 + $10/monthly. One thing you could do with this is capture video of accidents, even when you’re away, so you can find the miscreant. Another use is recording encounters with police. Also in the theme of interior video cameras, Jaguar and Honda were both showing cars with eye tracking, so they can warn when the driver is dozing off. They also both had adaptive cruise control and lane drift notification. The Honda also has Apple CarPlay and Android Auto. Honda is killing it for a mid-range car. ActiveScaler is working on an Android rear view “mirror” that clips on in front of your actual rear view mirror. They leave about half for plain old mirroring and use the remainder of the screen real estate to display whatever whackiness you can come up with. It’s basically an easy way to add a device. $500. There were a lot of VR booths. The line for the HTC Vive was psycho. Oculus and Samsung Gear had booths. I checked out a company with a head-mounted virtual monitor. You could use it to watch TV or do computer stuff. I was hoping for an IMAX-sized monitor, but no luck. My favorite thing in this space was an augmented reality kit for play structures, from a company called Biba. They do virtual overlays on things like monkey bars. I’m totally good on AR apps for kids, since the kids have to be out in the real world to use them. It’s not screen time. Pokemon Go is cool with me. There were a bunch of Internet of Things vendors. These are dominated by mega companies like ATT, which makes me think IoT is a trojan horse for companies I hate. Among the wearables, my favorite was a hybrid analog+digital watch from Withings. The face is a fully analog watch. The back is a fitness tracker. I loved the the idea of keeping sensors discreet. I don’t feel like a fitness tracker is the end of the line for this kind of thing. It could have vibrate, take voice commands, play music, give turn by turn directions. An Echo on your wrist, with a deceptive analog face. And the winner was the RoBoHon, a work of cute mad genius Japano-wtf-philia? It is a little robot, about the size of a Barbie doll, but much beefier. The robot can walk. It is controlled via voice (but only Japanese). It is a phone when you pick it up and hold it to your ear. 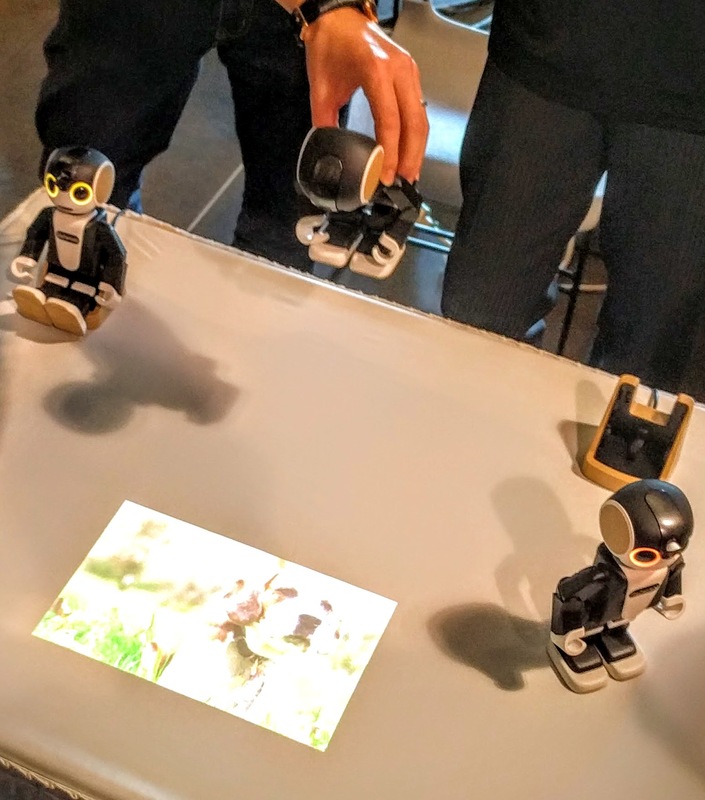 It has a projector, which it can use to create a virtual screen on the table in front of it. Of course – why not? – it has a video camera. $2000. I saw this as potentially incredible telepresence tool. The remote caller’s video face would be visible via the projection. The video camera would pick up the local member of the call. The remote caller would manipulate the robot to turn and look at the speaker during a meeting. Maybe the robot would actually walk across the conference table to be near the speaker; this would fix the problem of a conference phone being stuck in one place. I asked the rep if RoBoHon could detect touches on the projection, so apps could do something like a touch screen. He said not yet.